The discussion of the afterlife has become a very popular subject. 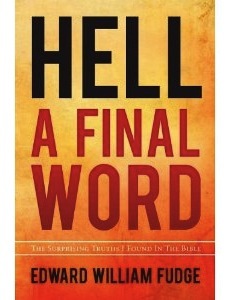 Recent books like Rob Bell’s Love Wins followed by Francis Chan’s Erasing Hell have brought this topic to the “front burner.” Believers and non-believers alike are re-evaluating their understanding of heaven and hell. With a hopeful, good-natured, and sometimes playful tone, Fudge articulates the Bible’s message. It is this: God offers eternal life to everyone, but those who reject God’s offer will be completely destroyed in hell. The Bible does not teach a hell of endless conscious torment, nor a hell of purification where everyone ends up in heaven. The voice of the author often sounds like he has a gracious smile, and a knowing twinkle in his eye. This especially comes through when he discusses the apostle’s message in the book of Acts. Some advocates of the traditional view think that the fear of an endless hell is needed for successful evangelism or missionary work. Fudge shows that the evangelists in Acts focus on the resurrection of Christ, and never mention hell. With that knowing smile, he says: “One begins to suspect that the apostles motivated people with something better than fear” (p. 120). Thoughout the book, Fudge weaves the events of his personal life between chapters that teach the Scriptures. We see Fudge as a child, struggling with the death of a friend. We move through his early Christian education, his masters in Biblical languages, and two other seminary opportunities. He even humbly reveals how his thinking had changed as he studied, being refined as he embraced the clear message of the Bible. He says: “What a mess I made. But as my friend Jeff Walling says, if there were no mess, we would not need a Mess-iah!” (p. 38). Fudge’s love for the Bible and his devotion to God is evident on every page of this book. His father taught him, “If the Bible says it, it’s true, no matter what any person may say” (p. 148). His writing shows that he is faithful to his father’s teaching, and is willing to challenge both tradition and popular culture when they fail to align with the plain teaching of Scripture. I believe this book and the movie Hell and Mr. Fudge have the potential to ignite a new reformation in our day. We are not done being “reformed.” We do not have perfect knowledge. We have strayed from the clear teaching of Scripture on this important subject and in the process, are driving people away from the One who died and rose again to save everyone. It’s time to return to the Scriptures and ask God for the message He wants us to share with the world today. I encourage everyone to buy this book and take it to your church, small group, Bible study, or Sunday School, and discuss it together. Bring “an open Bible, and open heart, and an open mind” (p. 11). Let’s see what God will do! Next: Next post: Hell And Mr. Fudge: The Most Important Movie Of The Year? I echo the above sentiments concerning Fudge’s smile and the twinkle in his eye as he describes his explaination of his beliefs. I recently had opportunity to sit in a discussion that he led in Dallas on this topic. @Dan, thank you for comment. I would have loved to have been there! May more people in the world see the twinkle through his book and upcoming movie!